Early in the third century, it was to Callistus, then a deacon, that Pope Saint Zephyrinus confided the government of the clergy, as well as the creation and maintenance of the Christian cemeteries, which at that time were the catacombs of Rome. At the death of the Sovereign Pontiff, Callistus succeeded him as Head of the Church. It is he who made obligatory for the entire Church, the fast of the Ember Days which the Apostles had instituted, to bring down blessings on each season of the year. During his time, the Christians began to build churches, which though destroyed during the various persecutions, were eventually rebuilt. Among the catacombs owed to his government, is the one on the Appian Way which bears his name. Many precious memories are conserved there; in it are found the tomb of Saint Cecilia, the crypts of several popes, and paintings which attest the perfect conformity of the primitive Faith with that of the present-day Church. 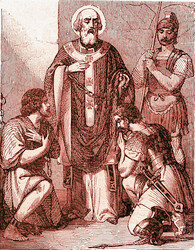 During the pontificate of Saint Callistus, several very striking conversions occurred among the very officers of the persecuting emperor Alexander Severus. At one time an officer, his family and household, forty-two persons in all, were baptized by the Pope on the same day. Many others asked him for Baptism; among them a Senator and sixty-eight persons of his household, and a guardian of the saintly Pope, whose name was Privatus, after the prayers of the Holy Father had cured him of an ulcer. All these new Christians were martyred, and their heads were exposed at the various gates of Rome to discourage any who would propagate the Faith of Christ in that city. Despite the continuing pursuits and his constant solicitude for all the churches, Saint Callistus found the means to have a diligent search made by fishermen for the body of a priest of his clergy, which had been cast into the Tiber after his martyrdom. When it was found he was filled with joy, and buried it with hymns of praise. During the persecution Saint Callistus was obliged to take shelter in the poor and populous quarters of the city. The martyred priest, Calipodius, appeared to him soon afterwards, saying: Father, take courage; the hour of the reward is approaching; your crown will be proportionate to your sufferings. Soon afterwards he was discovered there, and the house was guarded by soldiers who received the order to allow no food to enter it for several days. And Saint Callistus was martyred in his turn. With a rock suspended from his neck, he was thrown from a window into a well on October 14, 223. The priest Asterius recovered and buried his body in the catacomb named for Calipodius. A week later Asterius too was arrested and thrown into the Tiber. The Christians interred this martyr also. Reflection: In the mortal remains of a Christian, we see what has been the temple of the Holy Ghost, and which still is precious in the sight of God, who will watch over it and one day raise it up in glory to shine forever in His kingdom. May our actions bear witness to our belief in these truths. It is now no longer I that live, but Christ lives in me.